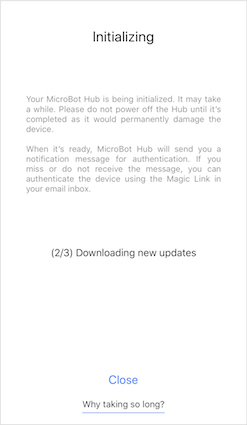 It is necessary to update MicroBot Hub S (aka Prota S) to its latest version in order to enjoy all the benefits brought by the latest update: MicroBot Cloud. Note: When updating and adding your Prota S to MicroBot Cloud, all your current Prota apps, app data and stories will be lost. an Android or iOS device authenticated to MicroBot Cloud. See Authorize your device. Add a Hub. 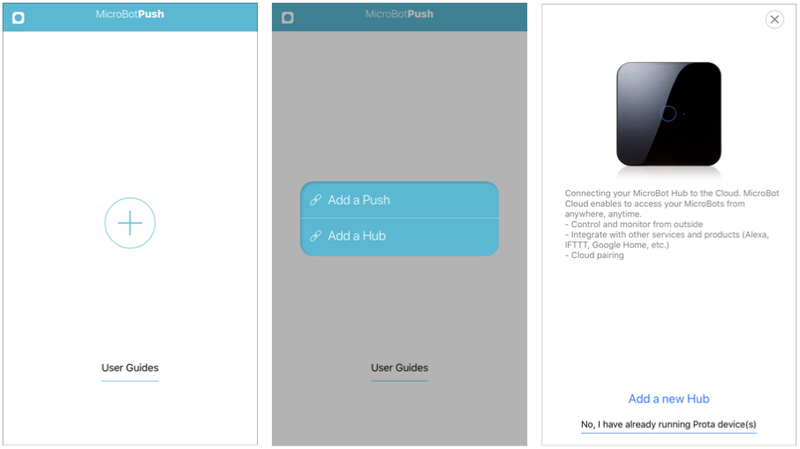 In MicroBot Push app, tap +, select ‘Add a Hub’ and choose 'No, I have already running Prota device(s)'. Upgrade your hub. Choose your Prota from the list and select 'Upgrade'. Note: When updating and adding your Prota S to MicroBot Cloud, all your current Prota apps, app data and stories will be lost. 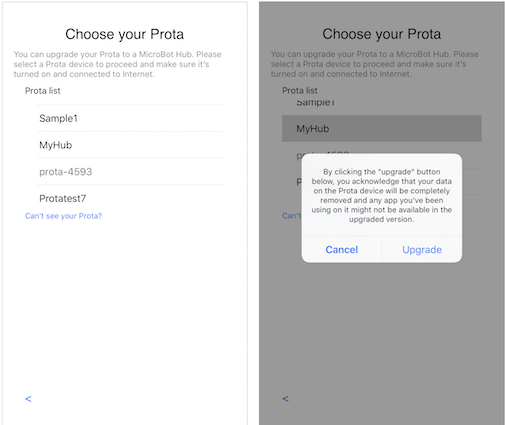 Moreover, any Prota app you've been using may not be available in the upgraded version. For more information, please contact our Support Team. Initialization. Once you've selected your Prota, wait until the initialization is completed. It may take a while. Note: Depending on your network and various factors, the initialization may take up to 30 minutes before it proceeds to the next step, authorization. Authorization. 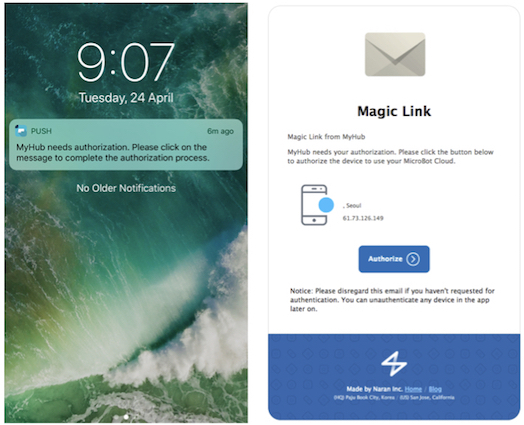 At the end of the initialization, authorize MicroBot Hub by either touching the pop up notification or clicking on the Magic Link you received by email. Then, tap done! 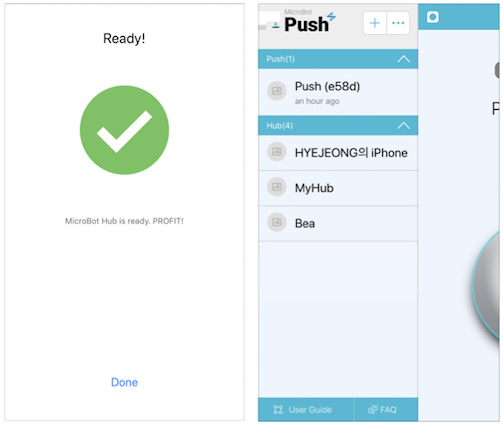 Once the authorization is completed, your MicroBot Hub (prota-xxxx) can be found in the left side menu, together with your smartphone and paired MicroBots. Note: In the list of registered devices, if your MicroBot Hub's name is highlighted in light yellow, it means the initialization or upgrade has not been completed yet. In this case, tap on your Hub's name to resume it.